SM Megamenu 1.9.x is an upward trend for web design especially e-commerce stores. If your site involves a variety of products, a number of categories, Mega Menu is what you have to put in to consideration. The reason is that Mega Menu offers an effective way to improve website usability and navigation! It takes your customers fewer clicks, thus, saves their time to get to where they really want. Using this module it can be possible for you to display not only category list but also special products, banners or contact form, etc. This guide will help you install SM Megamenu extension step by step. 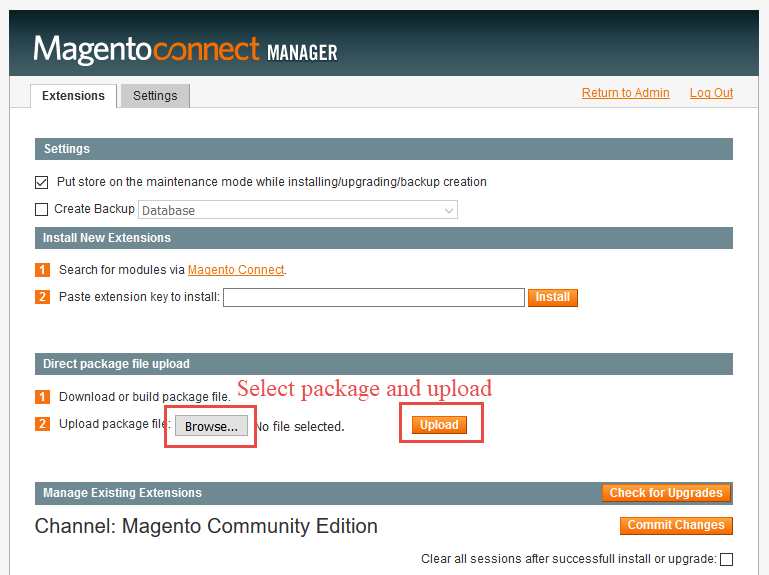 This module is fully compatible with Magento Community Edition version 1.9.x, 2.x. Click here to view documentation SM Megamenu 2.x. 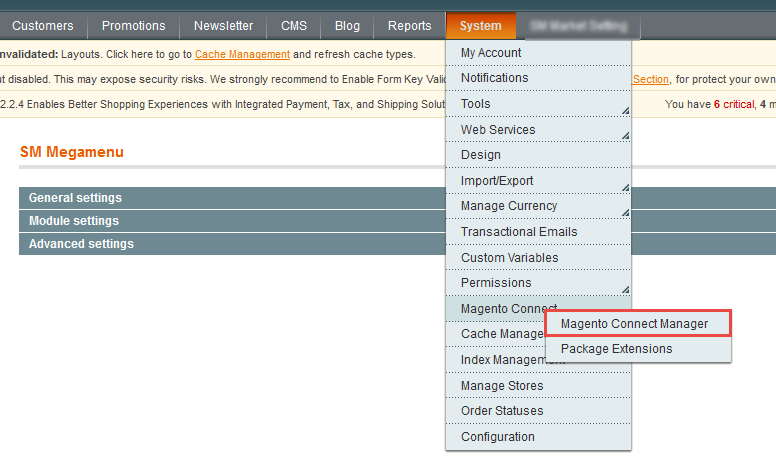 Step 2: Upload folders skin, js, lib, media and app from our download package to the root of your Magento site on your server. 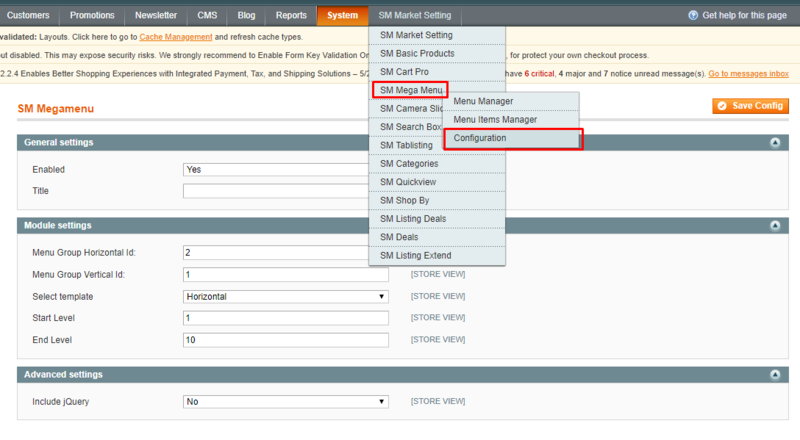 In the Administrator Page, navigate to Stores -> Settings -> Configuration and find SM Megamenu to configure. Title : Enter title of module. Menu Group Id: Enter menu group id that you created step 1. Select Effect: We support effects for Mega menu (CSS/Animation/Toggle). Title: Enter the name of the menu. Show Title:Choose “Yes/No” to “Enable/Disable” the title. Status: Choose “Yes/No” to “Enable/Disable” the menu. Description: Enter the description of menu. This parameter can empty. Align: Align position of menu: left or right. Parent Items: Select parent items. If you set menu is level 1, you must select parent items is “menu group”. Column Number: If you are using mega submenu, the elements in a mega submenu will be organized into columns. You can set width for each columns (maximum 6 columns in one row as percentage of the submenu width) by chaning this param. Icon: Display a small image next to the menu name. Menu Type: We provided list of menu types that you can select.